Kursk Battles (75th Anniversary) - a gaming theme for July. 7th July 1943 - By the third day of the Kursk campaign, German casualties steadily increased as their forces threw themselves against the well prepared Soviet positions in an effort to crack the first two defensive belts. The day began with 20th Panzer Division pressing into the 3 km gap between the villages of Samodurovka and Kashara, to open the way for an assault on the strategically important town of Teploye that lay beyond. The fighting was tough and repeated assaults had to be made against the determined defence. This scenario represents one of those assaults following a short lull. By noon, they eventually broke through and advanced towards the high ground to the south of Samadurovka, while 2nd Panzer Division on their left shoulder, exploited the gap and moved against Teploye. This Tigers at Minsk rule set was specifically designed around using hexes and figures in a small space, so here we are using the Kallistra Hexon four inch (100mm) hexes in a grid that is 8 wide by 6 deep and which just so happens to fit within a large pinboard, allowing the game to easily be moved to one side while the dining table gets hi-jacked for meals etc! Each turn the player chooses a hex plus any two adjacent hexes as being the commanders immediate focus. Those hexes are automatically put into command, which means those forces will be guaranteed to do an action. Every other friendly occupied hex must test to see whether it is in command or not. This loosens players control in the game and stops ‘perfect’ play. 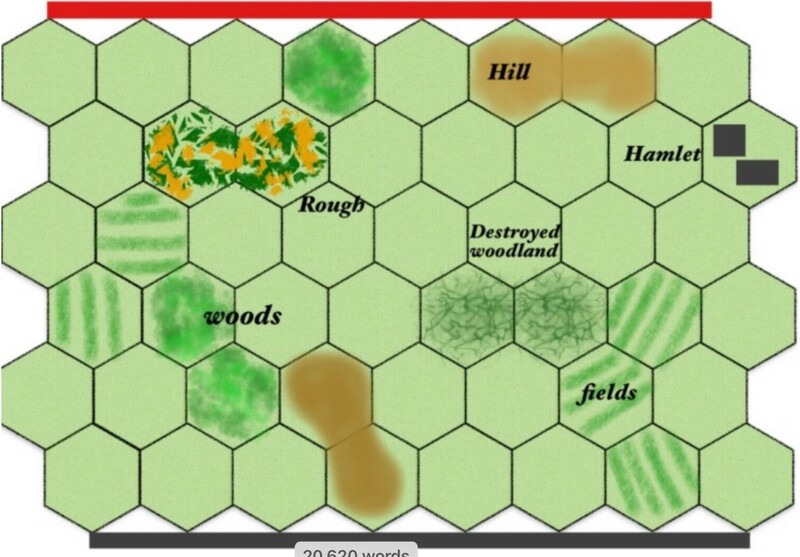 There is a small woods feature on the board which has previously been devastated by artillery fire, so the terrain feature resembles something of a WWI scene of shredded woodland. It is classed as ‘rough’ terrain. A unit can try and fire through it to a target on the other side, but must first test to see whether it ‘catches a fleeting glimpse’ of its target or not, again removing certainty and as it happens, having quite an effect in this replay as the defenders invariably managed to see the enemy, while the attackers were not so fortunate. The Soviet side have fairly good terrain to set-up in. They also (and unusually for a defender) set up second, so they get to see where the attackers have concentrated when forming up and can deploy accordingly. Their order of battle includes two heavy machine guns and the useful 57mm anti-tank gun, which is too big to claim automatic ‘in cover’. The German side has good attack capability. They have Panzer Grenadiers that get 3 attack dice rather than the usual 2 afforded to a standard rifle section, plus they have a platoon of three Panzer IV’s ......what can go wrong! Only the Russian player gets an off-board Fire Mission. They have an observer on high the ground on the Soviet baseline, which brings in the fire and gets a bonus for elevation. To avoid becoming target rich (units bunched up give the firers an extra die) the Germans start by spreading out right along their base line. The tank platoon and the better troops are out on the right flank, this is clearly the focus of attack. The Germans advance into a maelstrom of fire, that includes observed off-board artillery fire. The 57mm anti-tank gun, tucked down amongst some rough terrain could see the Panzer IV’s prowling on the other side of the destroyed copse of trees. It struck the lead tank, causing some minor spalling injuries to the driver and then the artillery struck and concussed the crew of a second tank. Both vehicles halted, though with no obvious signs of damage. Surprisingly, within five minutes or so, they were both moving again, but the infantry, mostly in the open, that accompanied the attack were not so fortunate. They took grievous casualties, with their furthest advance only getting them amongst the shelled woodland. As the casualties mounted, German morale crashed through the floor, causing every unit to take ‘fall back’ tests. Some did fall back, which disrupted the attack, but then another base was removed, forcing another fall-back test and this combined with the retreats of the last test, proved devastating. Everything failed and fell back. To make matters worse, a tank, a mortar observer team and two rifle sections, who had already fallen back to the baseline, retreated off the table. By 0823 hours it was all over, the attack had fully stalled. I enjoyed getting back to Tigers at Minsk, there is much less rules overhead compared to my recent boardgaming. Despite this scenario being well play tested and generally bringing a tight game previously, this particular playing brought unusual extremes in die rolling and in this case it was all one way traffic in favour of the Soviets, who rolled an unusual amount of sixes. The Germans have a lot of potential fire dice, but if the dice hate you .... what can you do! Anyway, the game felt right as it played, the crushing, effective fire ground down the assault, but obviously from a ‘play’ point of view, it was somewhat unsatisfying. I will come back to this before the month is out. I have included an old replay of the scenario in the Resource Section below, it was written up when the system was younger, but is interesting from the point of view of scenario / system evolution. We are returning to the Dark July module next and doing the ‘Midday Counterattack’ Scenario. This gives a flavour of the big tank battle and uses the full map, you just ignore the anti - tank ditch which is converted instead to a mix of trench and clear terrain. A large Soviet force is moving west to counter the German advance. This scenario has a lot more tanks in it (17) than I have seen in a Lock ‘n Load game before, so of itself, that should prove an interesting game and is worthy of a Prokhorovka scenario. 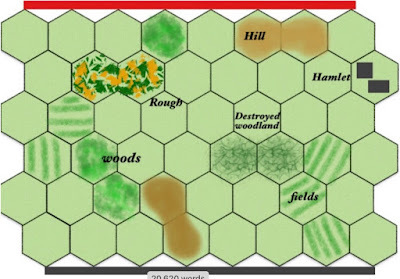 For that game, I am putting my larger X-Maps out, to add to the spectacle of the big battle and also give a better sense of ranged fire of the powerful tank guns as the larger distances across the map will give a different visual perspective. I actually had the game set-up, but have had to take it down as a few days of the ‘heatwave’ have returned and my glass house games space punishes both gamer and game materials once temperatures reach mid - thirties. Kursk - The Greatest Battle, Eastern Front 1943 by Lloyd Clark and published by Headline Review. I am no further in on this, simply because play volume and associated write ups is all time consuming. Thanks for posting this. Lots of great texture to add to the narrative (German forces not spotting Soviets through the destroyed copse) and extra Soviet firepower to lend to the defense. I still need to achieve a win for the Germans in "follow the Elefants"! Your AAR really makes me want to try this scenario although my table is covered in the detritus of Talavera preparations and it would take way too long to figure out. By the way, I love your pinboard setup. Really cool how the game is on a tray that can be more easily transported. I wonder how that would work/look with 6mm troops. Thanks Steve, I think for 6mm troops the terrain would be an even better fit, particularly buildings and ranges might look a bit more realistic. I originally did the pinboard thing as a way to help a bad back, as it reduced foot print and so no leaning forward etc, you could just drag the board towards you. Being able to pick it up and plonk it somewhere else while the table gets used is something of a bonus. Because you sit at the board, 6mm would also be more visible / identifiable. Even in 10mm I struggle between a mortar and an HMG, I should have put them on different shaped bases. Greatly looking forward to Talavera. That was a quick decision, Norm, with the Soviets winning decisively. So glad to see your WWII figures and hex-based game once again out for a spin. Looks terrific with your Kallistra terrain pieces. Thanks Jonathan, There should be some scope this month to get some more of this on the table during this themed month. Time is the great constraint. I have been wanting to get TF-ON onto the gaming table but no luck yet. I still have Foz de Arouce out on the gaming table with plans to refight this one a time or two before I need to switch gears to Zorndorf in August. Nice AAR, your Germans are taking a hammering all over the place! Looking forward to the big tank battle! The dice know their history. No offensive break through for the Germans!